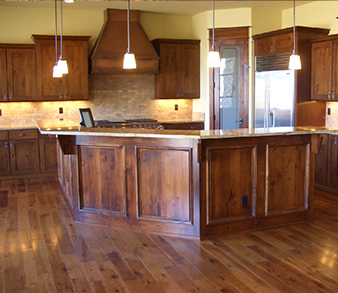 We are a small cabinet shop specializing in building custom cabinets at extremely competitive prices. As a rule, we are similarly priced with or even lower priced than the big box stores. Our tag line is "A custom shop experience at a "Big Box" price", and it's quite true. Affordable custom cabinets for every room in your home or business. Tim Kulin Cabinetry builds custom cabinets for kitchens, baths, home theaters, bars, and every other room in your home where beautiful built-in cabinets are needed. Of special interest to most prospective buyers is the fact that TKC is an extremely affordable option. At TKC, there is no such thing as a stock cabinet. Due to our manufacturing methods, we are able to build each cabinet to the exact size required. No longer are you tied to 3" size increments, unsightly filler strips, or compromised designs.